From Waterpik comes another one of the best water flossers available within their range which is fairly compact for a countertop water flosser, the Waterpik WP-660 Ultra Professional, also known as the Aquarius Professional. Featuring a new pulsation-modulation technology, a 1 minute timer, 10 pressure settings and 2 operating modes to ensure effective plaque removal and better gum health. It’s their most advanced water flosser yet. We’ve summed up all its best bits and pieces in our Waterpik WP-660 Ultra Professional review. Gums are strengthened over time through improved circulation from the massaging and stimulating motions especially combined with the new pulse-modulation technology using the Hydro-Pulse Massage Mode. Teeth and gums are given a deep clean in hard to reach areas, gum pockets and below the gumline. Clinical results have proven you can get healthier gums in just 14 days when using this on a daily basis. To get more of a clean and fresh sensation, the large 650 ml reservoir tank can be used with mouthwash on its own or mixed in with water. Clinical tests have shown regular use of this water flosser can reduce plaque and gum disease, reverse the effects of gingivitis and improve gum health more effectively than traditional string floss or the Philips Sonicare Airfloss can. People with crowns, veneers, implants, bridges, braces or other dental/cosmetic work can get a better clean with this oral irrigator by using the different tips included. Similar to most of the other Waterpik models, this one has 10 pressure settings for you to choose from. It starts off with a gentle to intense pressure for maximum cleaning. Using the lowest setting combined with warm water feels great for people with sensitive teeth. The highest setting is perfect for those problem areas within teeth and gums. It can take some getting used to on a high setting though so the most comfortable level is generally around the 5th or 6th setting which is strong enough to flush the day’s food debris and accumulated plaque out. It’s impossible to get a quiet or soundless electric flosser even if it’s the best water flosser which will still make some noise. There are ones that can be fairly loud especially the older Waterpik models but this one makes a somewhat quiet buzzing sound when it’s on. 3 Classic Jet Tips – has a rounded pointed tip that makes flossing easy and effective for daily use. It sprays out a single jet of water stream that’s ideal for a more targeted clean. Having 3 of these tips allows for a multiple number of users or last 1 person a longer time before having to buy more. Toothbrush Tip – allows users to brush their teeth with the circular brush head and floss at the same time which helps to cut down your oral cleaning routine. The removal of plaque and food debris is twice as powerful as the toothbrush acts as an electric toothbrush does too. Plaque Seeker Tip – helps to remove unyielding plaque and common areas where plaque accumulates with the 3 narrow brush bristles. It’s ideal for people with crowns, veneers, implants, bridges or any other dental restorations as bacteria and debris is removed in those hard to reach areas. Orthodontic Tip – has a small brush at the tip making it ideal for brace wearers. The brush enables users to clean underneath wires and around brackets of braces to efficiently remove plaque and food bits that are stuck. Using it for general use is great too as it can clean quite well with overlapping teeth. Pik Pocket Tip – with the slim and pointed tip, this is perfect for deep cleaning in gum pockets, below the gumline and for gaps in between teeth. It’s very effective in eliminating bacteria and removing plaque whichever setting the pressure is on. Tongue Cleaner – the flat head enables this tool to be used to scrape and clean your tongue whilst water flossing. Bacteria and sulphur compounds are swept off the tongue to prevent bad breath and leave a fresher and cleaner feel. Fitted with a European rounded 2 pin plug, this electric water flosser has a global voltage of 100-240v. It can be used in UK shaver sockets in the bathroom or plugged into a shaver adaptor and used in the usual UK 3 pin plug sockets. With its small size, the WP-660 won’t take up much space in any bathroom. From its efficiency at plaque removal to improving your gum health, hopefully my Waterpik WP-660 Ultra Professional Review has summed up all its best features and benefits to prove to you how this machine can change your oral hygiene. If you want to see how the WP-660 stacks up against other water flossers, then take a look at our comparison table. The following video by Waterpik shows you how to use the Waterpik WP-660 Ultra Professional water flosser. 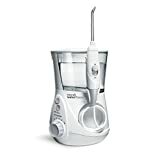 Copyright ©, BestWaterFlossers.co.uk | All Rights Reserved | We compare and review the best electric water flossers / oral irrigators for removing dental plaque.